After Major Croghan's failure to capture Michilimackinac the Americans are on their way back to Detroit. 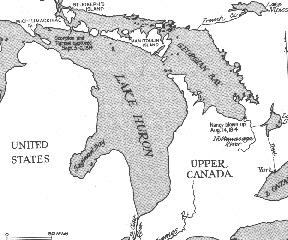 In route a British prisoner tells them about a supply depot a mile or so up the Nottawasaga River. The Americans anchor in a small harbour, from there the men remove the guns from the ships and they move up river to destroy the supply depot. Captain Arthur Sinclair the U.S. Fleet Commander has also learned that the British sloop "Nancy" is expected to take on supplies deposited at the river mouth earlier for Mackinac. The Americans reach the depot and destroy it, they also destroy the "Nancy" the only British ship in these northern waters. The "Nancy's" commander Lieutenant Miller Worsley, and his sailors manage to reach Michilimackinac by canoe. Here he convinces Colonel Mcdouall into letting him make a night assault on the two American schooners still blockading that island. On the night of September 3rd four boatloads of sailors and fencibles surprised the "Tigress" and captured her by boarding, with the loss of only two killed and eight wounded. The British manage to obtain the "Tigress's" signal book before one of her crew can burn it. Lieutenant Worsley now has the flag codes, he sends a man in a canoe to locate the "Scorpion", in two hours he returns and reports the "Scorpion" is fifteen milles away and heading their way. Worsley keeps the American pennant flying and has his men hide by laying down on deck covered by their grey coats. He dresses his officers in the captured American uniforms. The signal flags deceive the Americans; no officers are on deck and the "Scorpion's" gun crew are busy scrubbing the planking and pay no attention to the "Tigress" until it is to late. The British throw the grappling-irons and start firing their muskets, they pull the two ships close together and start boarding the "Scorpion". They take the bewildered American crew prisoners. These acquisitions provided the Royal Navy with a makeshift force on Lake Huron for the balance of the navigation season. No further attempts were made against Michilimackinac by the Americans, but they did launch two expeditions against Prairie du Chein, both of these were scattered in route. The fur country, almost as far as St. Louis, is in British control and will remain so until the treaty of Ghent restores everything to the "Status Quo". In the northwest at least, the British flag waved undisputed. On the Niagara Frontier, after a great deal of fighting on both sides, the Americans only hold Fort Erie.